Coene Mesritz was a real Meppeler. He was one of seven children of Elias Mesritz from Meppel and Zwaantje Bargeboer from Winschoten. Coene was born in Meppel on the 12th of May 1879 and lived here all his life. On the 15th of October 1881 he married Hanna van der Kaars, born in Assen as one of six children of Jacobus van der Kaars and Mina van Oosten. Coene Mesritz had a textile business at 19 Molenstraat. Before that he had a small shop on Vledderstraat. He was still single then and lived there with his mother. Above the front door of his shop on Molenstraat there was a small window with his name ‘C. Mesritz’, usual at that time. He was an active member of the neighbourhood community ‘De Molenstraat’. 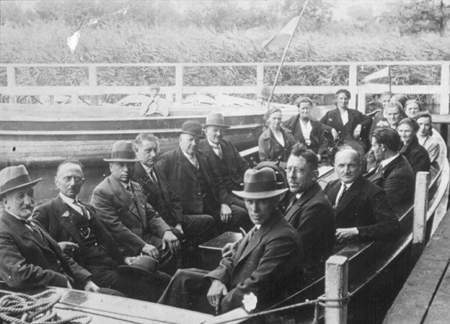 There is a photograph of a trip made by the neighbourhood community to Paterswolde in 1932. In the sightseeing boat, ready to depart, Coene sits among the neighbours. Coene Mesritz (3rd from the left in the hat) was one of the shopkeepers in Molenstraat who took part in the day trip to Paterswolde. Mesritz was an exceptional man; he had lots of friends amongst his clients. When he celebrated his 25th wedding anniversary, all the clients received an invitation for his party. A big party, as they were very popular with their neighbours too. His wife was a maternity nurse for many of the customers who had a baby. On the invitation was written, not completely untrue, ‘On the occasion of our 25-year-old (v) echtvereninging’ (fight (v) echt (marriage) vereninging - union) - a pun. Coen and his wife had a relationship where quarrels were not an uncommon, you see. Coen Mesritz tried to add to the moderate income of his shop with other activities. He would go on his bicycle as a travelling salesman and sell his merchandise in the area. It was in the line of expectation: the shop of the Mesritz family was declared closed by Omnia from the 25th of June 1942. It was also Omnia that informed the Chamber of Commerce. Shortly before the business was closed Dr. Weinrauch, the liquidator , decided to take the cash of f 1700,- from the till. Furthermore Mesritz was obliged to send all his trading stock to Omnia. were then confiscated by the Wehrmacht. 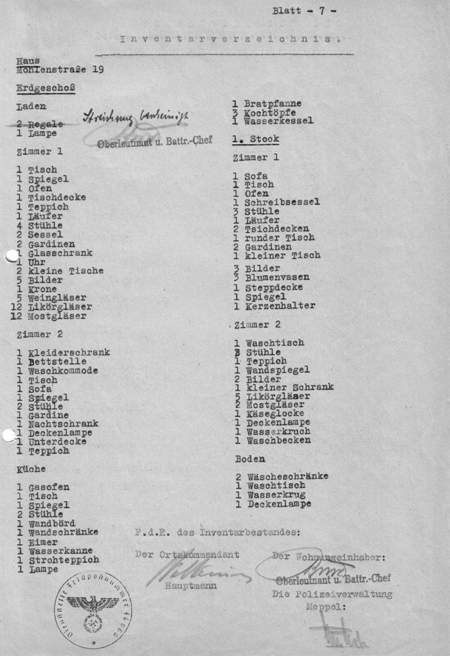 Coene was transported to labour camp Orvelte on the 31st of July. From there, around the 3rd of October he was taken to Westerbork. There he probably saw his wife again, but not for long because both were transported to Auschwitz on the 5th of October and exactly three days later (the Germans were punctual in their work) they were gassed. 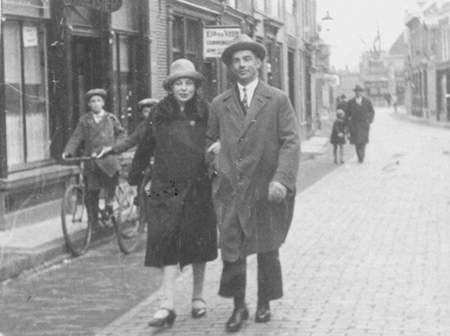 Coene as well as his wife Hanna (van der Kaars) did not survive the war; the shop never opened again. Another sister of Hanna, Roosje also lived in Meppel. She was born in Assen on the 27th of November 1882 and in 1916 she married Nathan Nathans, who died three years later. They had one daughter, Jenny Mina Nathans.She was born on the 22th of may 1917. By the way, Nathan was a relative of Coenraad (his mother was a Mesritz). In February 1941, Roos moved to Meppel. First she came to live with her sister and brother-in-law on Molenstraat and from the 14th of September 1942, she lived at 76 Woldstraat for nineteen days. On the 3rd of October she was forced to leave Meppel; like her sister and brother-in-law she was transported to Auschwitz on the 5th of October 1942 and was killed three days later. behind the couple in this photo.